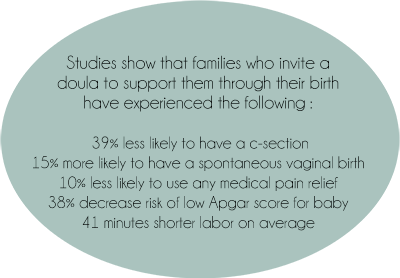 My goal as your doula is to help you to have a positive, safe, and memorable birth experience. Physically: Before the birth of your child we will go over various positions, massage, and breathing techniques you can practice in preparation for your birth. During your delivery, I will be there to physically support you, serve you, bring you water, food, and help to make you as comfortable as possible. Along with your partner, I will assist as your labor coach, and be constantly by your side so that your partner can take a break when needed. Emotionally: A big part of being a doula is being there to listen to your concerns and feelings leading up to, and through your birth, and to provide you with information which will hopefully calm any fears you may have. My goal is to be an encouragement, listening ear, a source of information, and a faithful support to you throughout your pregnancy and birth. Informationally: I am intentional about providing my clients with evidence-based information. If you need information during your pregnancy, I will direct you to evidence-based information, to help you feel empowered and confident in your pregnancy and birth decisions. Often, your birth attendants may not (have time to) explain in detail what is happening, and as your doula, I am there to help you make informed decisions, understand what is happening, and know your options. Your Partner: Your partner has a key role in your birth; I will by no means replace him through your birth, but instead be an additional support, first to you, and also to him. There will most likely be times (especially through a first labor) that your husband may need a break (mine certainly did through my 42 hour labor)! It is so helpful to have another person present whom you can count on for support. This will also give him the chance to use the restroom, stay in touch with family, get a breath of fresh air, or even, in very long labors, take a quick nap, while not feeling bad about leaving you alone briefly. You: Finally, and most importantly, I will be present as a constant advocate for you. Often through a birth most of the focus is on your baby, especially towards the end. My focus will be 100% on you throughout your labor; I will be there to advocate for you and your birth plan, to support (and help give you more information for) the decisions you make, give you tips/assistance as you start breastfeeding, and to help you to have a fulfilling and positive birth experience. quick direction to evidence-based information for any questions/concerns you have. ◦ Connections to additional resources as you continue your postpartum journey. • Postpartum, I will be available via phone/email to provide additional support to you and your partner. If you are considering inviting me to serve as your doula, please reach out to me, and we can set up a time for a free, “mutual interview” to see if we are a right match for each other. Birth packages start at $1750.